Outlander’s second season opens with Claire reluctantly opening her eyes at Craigh na Dun. She’s back in her own time, and she quickly discovers that the British won the Battle of Culloden. She is not in a great place emotionally. This season will be very lush and—since much of the action takes place in 1740s France—heavily populated by possible/definite snakes wearing lavish court dress, which we will cover in great detail. Not yet, though. Right now, things are looking pretty dismal. Much of Claire’s wardrobe in this episode is made for miserably mourning your second husband who’s been dead for centuries and you don’t even know where he’s buried and you’re back with your first husband who’s really upset and also looks just like a horrible sadist who gave you a lot of grief. Her 18th Century attire—the colors of which once looked so rich—suddenly resembles the saddest corner of your grandma’s attic. That sweater is woven from a hand-spun gloom cloud. However, a round of applause to Tobias Menzies for looking so great in those wide-lapel suits of the late 1940s—not the easiest look to knock out of the park. And my God, look at little Roger Wakefield and his little little baby cheeks and his little baby sweater and his little baby tie. Clearly Claire has turned a corner by the time she steps out onto the tarmac at what appears to be LaGuardia airport in New York City, because suddenly the whole color palette is different. I’m not thrilled she’s back in her present, but I’m very excited for her closet to get an update. That hat! That airport when it was not a complete hellhole! Somehow it seems even more luxurious than the court of Louis XV could ever be. 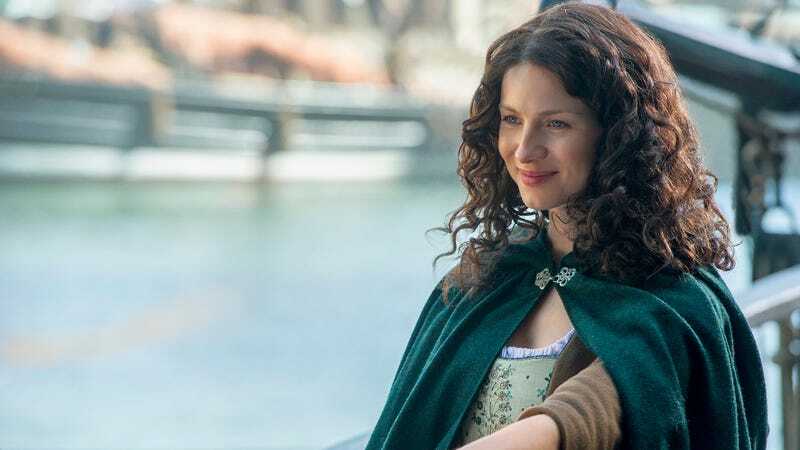 Aaaand then we’re back in 1745, in Le Havre, France, where Claire and Jamie are setting out to stop the Jacobite rising, despite the fact that Claire knows almost nothing about how the Jacobite rising actually plays out. It’s like that nightmare where you forgot to study for the test, but so much worse. And as Claire quickly makes an enemy of the Comte St. Germain when she diagnoses a case of smallpox and, in so doing, costs him a ship and an entire cargo of goods. How does this woman think she’s going to avert a long-brewing rebellion when she can’t last a full 24 hours in a new town without acquiring an obviously powerful nemesis? God bless!